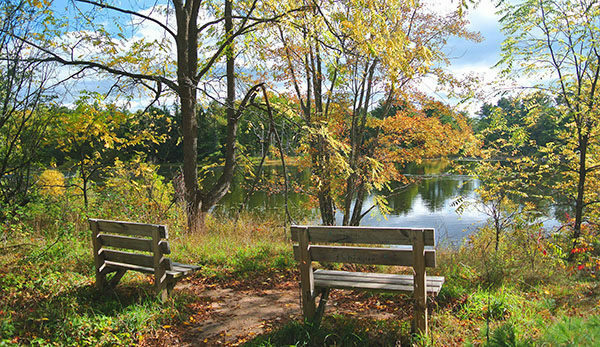 The Silver Lake Recreation Area is a 84-acre park in Garfield Township with a split personality. The east half of the recreation area has the usual park-like amenities; tennis and basketball courts, picnic tables, three covered pavilions, grills and a large playscape for children, all located in a large grassy open area. The west half of the park is a natural gem. Reached only by descending the bluff overlooking the West Branch of Silver Lake (also known as Dryer Lake and Mud Lake) this area contains extensive wetlands, mix forests more than a mile of trail and a small lake that is so well hidden from the rest of the park they named it that; Hidden Lake. The Silver Lake Recreation Area is a 84-acre park in Garfield Township with a split personality. The east half of the recreation area has the usual park-like amenities; tennis and basketball courts, picnic tables, three covered pavilions, grills and a large playscape for children, all located in a large grassy open area. In 2013 the township added a fenced dog park. The west half of the park is a natural gem. Reached only by descending the bluff overlooking the West Branch of Silver Lake (also known as Dryer Lake and Mud Lake) this area contains extensive wetlands, mix forests more than a mile of trail and a small lake that is so well hidden from the rest of the park they named it that; Hidden Lake. Both halves of the park make it an ideal destination for families with young children and dog owners. The trail described here is a 1.5-mile loop that includes almost all the trails in the natural half of the park and a small portion of the paved, accessible trail that forms a 0.7-mile ring around the developed half. Include the entire paved trail and you’d have a 2-mile route. The trails at Silver Lake are open to hiking, mountain biking, snowshoeing and cross-country skiing though they are not groomed or tracked in the winter. The second parking area from the entrance is aligned along the paved path and from there you can head southeast a couple hundred yards to pick up the Meadows Trail. This trail descends into an open meadow with a handful of disc golf cages scattered about. Side trails head to the cages but the main path is easy to follow and at Mile 0.3 ascends to the junction with Hidden Lake Trail. Head west (left) to enter the woods and quickly arrive at Hidden Lake. This scenic body of water is undeveloped and ringed by a marshy shoreline, thus attracting a fair amount of wildlife. Hidden Lake Trail skirts the south end of its namesake lake to a spur that leads to Lake Drive (Mile 0.6) and then along it’s west bank. Here you’ll be following a low ridge with Hidden Lake on one side and the West Branch of Silver Lake on the other, putting watery views of both sides of you. Large pines hugging the trail and a red barn across the water add to the park’s most scenic stretch of trail. At the junction with the Silver Lake Trail, you can head right to quickly reach a bench overlooking Hidden Lake. Silver Lake Trail leads further north along the larger lake, passing a short spur to the shoreline along the way. At one time West Branch was part of the much larger Silver Lake to the south but is now totally enclosed and, like Hidden Lake, much of it is shallow and marshy. Beyond the spur you make a steep but quick climb to the paved path, reached at Mile 1.3. Head south (right) to return to the parking area, passing the sledding hill along the way. The Silver Lake Recreation Area features restrooms, BBQ grills, a tee-ball field, tennis courts, basketball courts, a sledding hill, and a multi-use field for playing catch, football, or tossing a Frisbee. There are also three picnic pavilions at this park, which can be reserved in advance. Silver Lake Recreation Area is open daily from sunrise to sunset. There are no entrance fees. From South Airport Road head south on US-31 and in a mile turn west (right) on Silver Pines Road. 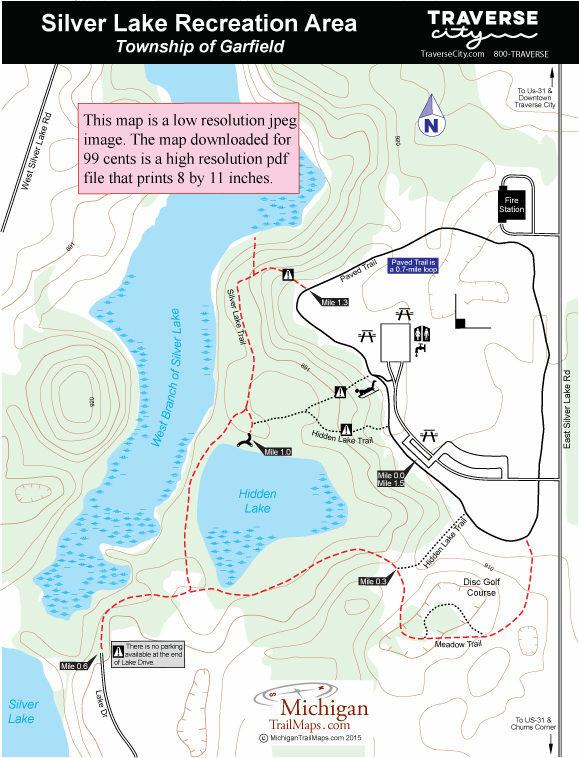 In 1.2 miles turn north (right) on East Silver Lake Road to reach the park entrance in 0.3 mile. Contact the Township of Garfield (231-941-1620; www.garfield-twp.com/silverlakepark.asp). For travel information contact Traverse City Tourism (800-872-8377; www.traversecity.com).